What I changed: Spinach in the butter sauce and more fresh on top and some basil pesto in the gnocchi as I didn’t have quite enough basil. Used the freezer for 20mins or so instead of putting it in the fridge for 1.5hrs. What I would change: No butter sauce, something tomatoey – although not so much to drown out the yum gnocchi. Preheat oven to 150°C. Place ricotta, feta, parmesan and egg in bowl of a food processor and process until smooth. Add flour and process until just combined. Transfer to a bowl and stir in chopped basil. Season with salt and pepper. Cover and place in the fridge for 1 1/2 hours to chill. Use a sieve to dust a baking tray with some extra plain flour. Use 2 teaspoons to scoop ricotta mixture, shape into rough balls and drop in a single layer on tray (makes about 24). Dust with flour. Bring a large saucepan of salted water to boil over high heat. Carefully drop half the gnocchi, 1 at a time, into the water. Cook, uncovered, for 5 minutes or until just cooked through. Use a slotted spoon to transfer gnocchi to an ovenproof dish. Cover with foil and place in preheated oven to keep warm. Return water to the boil and repeat with the remaining gnocchi. Melt 40g of the butter in a frying pan over medium heat until it foams. Add basil leaves and cook, shaking pan often, for 1-2 minutes or until basil is crisp but not brown. Drain on paper towel. Discard butter and wipe pan clean with paper towel. Add remaining butter to pan and heat over medium heat for 2 minutes or until it turns a light brown. Remove from heat immediately. 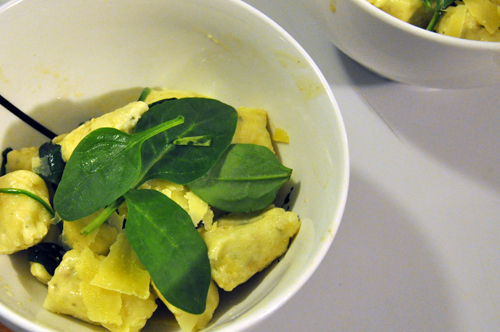 Place gnocchi on plates, spoon over brown butter, top with crisp basil and extra parmesan.